There was standing room only when the December 1 working session began. About 150 people turned out to start determining “What are some goals for the community,” which will continue at the January 12 working session. Rosemary Waldorf opened the meeting with a summary of the process to date including discussion of two “big rocks”: demographics and the town’s fiscal condition. Other resources requested by theme groups are available here. A couple of primary points that came out of Roger Stancil’s presentation were that the initial assumption was that the financial downturn would be shortlived, and as such, the actions the town had taken to mitigate the effect are not be sustainable over the longer duration. One of the functions of the 2020 comprehensive plan will be to guide budgetary priorities going forward. In the theme group meetings, participants had the ability to raise any questions they had about Roger Stancil’s presentation or request any further information they might need. Town staff provided a list of goals, based on the previous meeting summaries and prior discussion. The theme groups reviewed each goal, discussed why it was important, and began to wrestle with how to get there. Taking on seven to eleven goals was a challenge for all the groups, but they persevered. Some groups made excellent progress, working through several or most of their goals. Others spent time reforming their goals and will continue their work at the January 12 meeting. The meeting summaries and new information will be posted on the theme pages early next week for your comments. Reporting out from this working group meeting will occur December 15 from 7-9 PM at East Chapel High School. Dr. Roper and Brad Wilson of the UNC Health Care System will be making a presentation January 5 at 6 PM at Council Chambers. 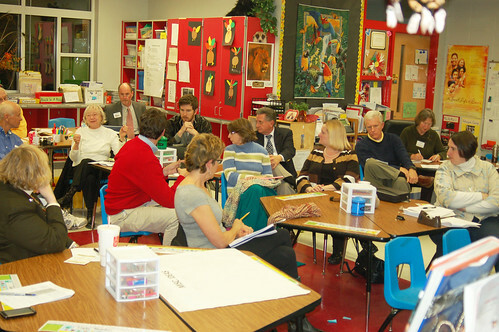 And the next working session will occur on January 12 from 4:30-6:30 at Glenwood Elementary School. I second John Schmidt’s questions about growth. It’s the elephant in the room. We plan for it with discussions of density and transit but we don’t have any concrete models to use to discuss it’s impact on quality of life. How much growth can we accommodate with our current water supplies? How much park space do we need to plan for the population at build out? How has ‘build out’ been changed quantitatively with the plans to build up in addition to building out? 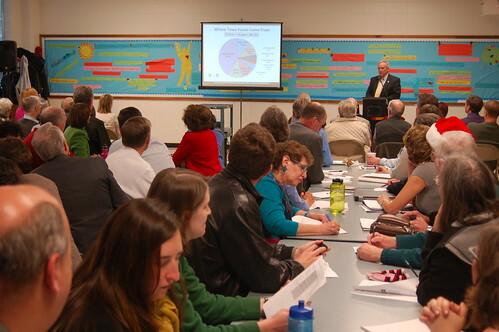 How will the schools accommodate more growth when they are already facing budget constraints? We cannot continue to talk about growth in the abstract without putting some actual figures on it so that everyone knows what it means financially, environmentally, and socially. Mitch Silver’s talk emphasized the inevitability of a coming wave of growth, the need to accomodate it with density, and the tax benefits of density (More tax revenue per acre). Not mentioned were the hidden costs of density: schools, traffic, police, fire, environmental protection and infrastructure of various types. In order to properly assess these hidden costs it follows that there is a need to demand cost benefit analysis for all future large development project proposals above a certain size. This all points to the question of how much density and why? What are the specific premises of growth for Chapel Hill — if we don’t build great density, why would there be great growth? After all there is a limited amount of undeveloped space in town. How much growth and density is the best choice if we desire to maintain Chapel Hill’s unique attraction as beautiful small town with good schools and great University?